Who does not shudder to hear the word AIDS - the immune system caused by the human immunodeficiency virus infections that trigger various diseases? According to the World Health Organization (WHO), about 2-million people died from AIDS in 2008. That amount may be reduced if people with AIDS know propolis. 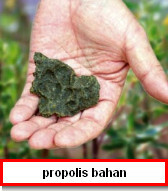 Propolis is not yet clinically proven coping with HIV. However, based on research in vitro - in the lab - conducted by researchers from the University of Minnesota, Minneapolis, USA, propolis has the potential to enhance the immune system of people with HIV / AIDS. The research team suspected antiviral substances contained in propolis inhibit viral entry into CD4 + lymphocytes. Propolis dose of 66.6? G / ml in cultured CD4 + cells - the immune system T cells that have CD4 receptors to inhibit expression of the HIV virus than 85%. Typically in patients with HIV / AIDS, the deadly virus infects CD4 cells and destroying bereseptor. Hence, the number of CD4 cells in the areas of HIV / AIDS fall far below normal. In healthy people, numbering around 500 - 1.500/mm3 blood.